It’s been almost a century since the Colorado River Compact was created, divvying up the resources of this mighty waterway between seven states and Mexico. That means almost 40 million people are dependent on the river in some way. Traditionally, the economic value of the river was based on what the water could be used for when extracted—things like agriculture, mining, and industry. Now, more people are pointing to the economic value of keeping water in the river itself. The Fraser River in Grand County is a tributary of the Colorado River, which starts in Rocky Mountain National Park. It runs through the heart of the town of Fraser and neighboring Winter Park. These towns attract skiers in winter and fly fishers and outdoor enthusiasts the rest of the year. Saffell says a loss of flow in the river would likely decrease the values for all properties in these mountain communities that are dependant on the river for a tourism economy. 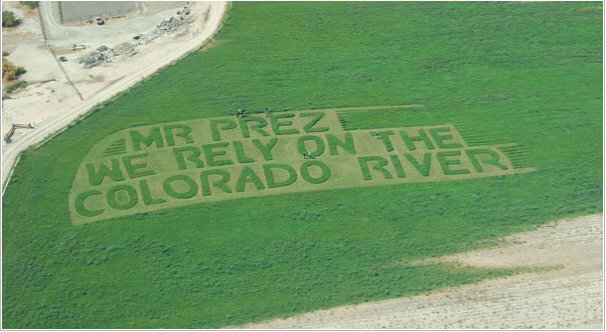 That’s something that others in western slope communities are well aware of, including Jim Pokrandt with the Colorado River District, the principal water policy and planning agency for the Colorado River Basin within the state. Pokrandt says the fortunes of many western slope towns hinge on understanding that the strength of local economies is beginning to shift from taking water out of the river to leaving it in. Historically, most Colorado water rights have involved uses that divert water from the streams, but back in the early 1970s lawmakers began to recognize the need to create rights allowing water to remain in the river, to help protect ecology. But that was just a first step. Now 43 years later, a lot of water is still being taken out of the Colorado River basin and diverted to the east. There are 13 major trans mountain diversions and many other smaller ones. It’s a concern for advocates like Craig Mackey, co-director of the non-profit Protect the Flows. “In the 21st century we have an economic reason to have the river itself, the recreation economy, the tourism economy and I think the hardest one to quantify is a quality of life economy,” says Mackey. Protect the Flows advocates for conservation of the Colorado River Basin, pointing to the connection between a healthy river and healthy economies. Protect the Flows worked with Arizona State University in 2014 on the first study on the economic impact of the Colorado River. It found that the major waterway generates $1.4 trillion in economic benefits annually throughout the entire seven state river basin. In Colorado, the tourism and outdoor recreation economy tied to the river brings in more than $9 billion annually. The Colorado Water Plan acknowledges the need to keep water in streams, but it also acknowledges the water needs of growing cities. Realtor Dennis Seffell says even more needs to be done. “Now it’s time to take a new fresh look as to why it’s important to keep rivers full of water,” Saffell says. A prolonged drought in the south west, paired with over allocation, has left the Colorado River in a sorry state. Front Range communities, largely dependent on that western water, are having some success with conservation. But with an additional 2 million people expected to move to the Denver metro area over the next 25 years, demand will only increase. Connecting the Drops is a collaboration between Rocky Mountain Community Radio stations and the Colorado Foundation for Water Education, with support from CoBank.